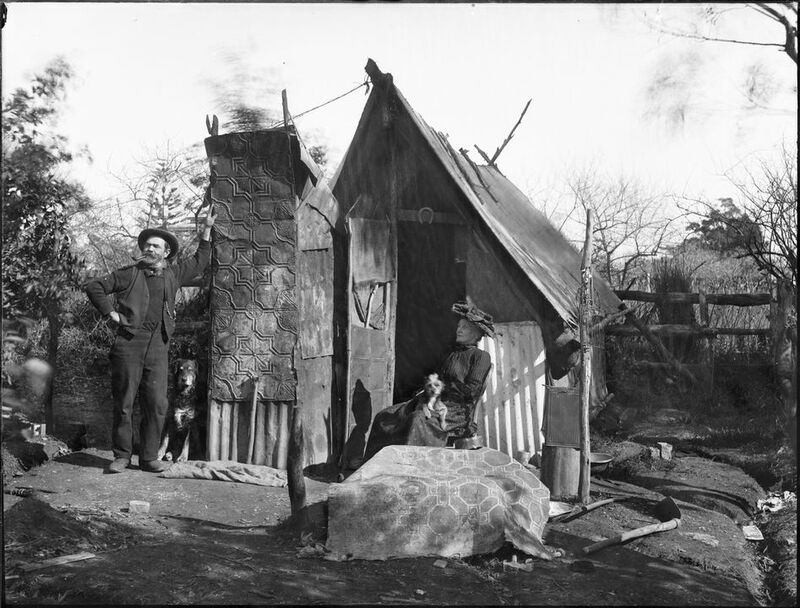 Landscape-format, black and white glass plate negative depicting a man standing outside a bush hut with a dog at his feet. The man leans against a Wunderlich panel which is part of the hut. A woman in dark clothing, wearing a hat is seated on a bentwood chair with a small dog on her lap. A piece of linoleum or carpet is draped on a rock in front of her with tools on the ground. In the background, behind the man's head, the roof of a large two storey house can be glimpsed. The photographic glass plate negative was photographed and produced in Australia, c. 1900. There have been suggestions that the Phillips collection of photographs was created by Harry Phillips, (1873-1944), an early twentieth century photographer born in Ballarat and best known for his photographs of the Blue Mountains. Recent museum research has shown that the photographer Harry J. Phillips, the uncle of Raymond W. Phillips, was born in Sydney in 1872. There does not appear to be any connection between the families of the Ballarat-born Harry Phillips and Harry J. Phillips. The donor Raymond Phillips was a rotograver and for many years was responsible for the Australian Women's Weekly cover. His father, Arthur Phillips, was a gold and silver merchant and was possibly the photographer of the glass plate negatives. In 1920, the family moved from Willoughby to Latimer Road, Bellevue Hill. A bachelor, Raymond Phillips remained in the house after his parents' death. The slides were found in a deal box in the garage.